The LG V40 ThinQ is another well-rounded flagship from the company that certainly deserves a lot more recognition than it gets. It’s also one of the few devices with a focus on providing a fantastic audio experience and of course, also offers everything we’ve come to expect from a current generation high-end smartphone. However, as is the case with every smartphone, this device is not without its issues either. We’ve rounded up some of the common LG V40 problems that owners face, as well as some potential solutions on how to fix them! Disclaimer: Not every owner will face these LG V40 problems. In fact, it is more than likely that you won’t come across any of these issues at all. There have been a few camera related LG V40 problems that have been reported since the device was launched. Some users have come across blurry photos or a lot of lag when attempting to take a picture. Some users have found that the device doesn’t switch to the telephoto lens as expected. Others have also seen images appear grainy, with a greenish tinge, and pixelated. The blurry photos and lag seem to be because of certain settings that are activated by default like the Auto Super Bright Mode and Auto HDR. These features allow for some great looking photos, but if you’re looking for better focus and faster shutter speeds, you may need to disable them until a software update addresses this issue. As far as the telephoto lens issue is concerned, more often than not, it does function as expected. Something to keep in mind though is that it needs bright lighting conditions to work and might not do so indoors. Finally, if images are appearing grainy, pixelated, with a greenish tinge, or with vertical lines, it is likely a hardware issue. The best option here is to pick up a replacement. Some users have found that the auto-brightness feature doesn’t work as expected. In a few cases, users have found that the brightness doesn’t go below 11 or 12 percent even if in very dark areas. This was an issue with the LG V30 and the LG G7 and seems to be one of the more common LG V40 problems as well. This seems to be a calibration issue with the auto-brightness feature. When in a dark area, manually set the brightness slider to zero even if auto-brightness is activated. Now toggle auto-brightness off and on and everything should work as expected. However, there are some versions of the device which don’t allow for the slider to be adjusted when the auto-brightness is activated. In this case, disable auto brightness, manually set the brightness to a low level, and activate the feature again. You can also download and use the Lux Auto Brightness app available on the Google Play Store. It’s one of the best tools around to get better control over the device’s auto-brightness feature. The free version of the app can be found here. Features like face unlock and the fingerprint scanner have generally been fast and accurate for most users, but some have had trouble using these to unlock their devices. For some users, the type of screen protector you are using seems to affect the performance of the fingerprint scanner (as well as the functionality of the Always On Display). If the screen protector is the type that covers the notch with a black border with cutouts for just the cameras and speaker, it affects the AOD feature and the fingerprint scanner as a result. The face unlock seems to work without issue, but users have found that a picture can be used to fool it. To avoid that happening, make sure that you select “Advanced Mode.” If the face unlock doesn’t work, you can scan your face multiple times for improved accuracy. As with any new device, connectivity issues with Bluetooth and Wi-Fi are common LG V40 problems as well. Both Wi-Fi and Bluetooth issues are prevalent with this device. One of the most common LG V40 problems has been related to Wi-Fi connectivity. This issue seems to be related to the aggressive battery saving mode that is built-in to the Android 8.0 Oreo. Go to Settings > General > Battery > Power Saving Exclusions and ensure that Wi-Fi is added to this list. You can also add other apps and features that may not be working as expected because of the battery saving mode. Turn the device and the router off for at least ten seconds. Then turn them back and retry the connection. Forget the Wi-Fi connection by going to Settings > Wi-Fi and long tapping the connection you want, then selecting “Forget.” Re-enter the details and try again. Go into Wi-Fi > Settings > Advanced and make a note of your device MAC address, then make sure it is allowed access in the router’s MAC filter. For issues when connecting to the car, check the manufacturer’s manual for the device and the car and reset your connections. Ensure you are not missing a vital part of the connection process. Go into Settings > Bluetooth and delete all prior pairings, setting them up again from scratch. For issues with multiple device connections, only a future update will be able to address this problem. Some software bugs don’t have a workaround available right now. The only option is to wait for LG to solve the problem in an official update. In a few cases, it may be a hardware issue, in which case, the only option is to pick up a replacement. Messages aren’t being received – Some users have noticed that there is a delay in messages arriving on the phone. This seems to be an issue with the stock LG Messages app. Users have found that the Google Messages app or any other alternate works well though, so until an update fixes this problem, it’s best to switch your default messaging app. Smart Lock issue – Even when users have Trusted Places set up, they’ve found that the feature doesn’t keep the phone unlocked. This is a GPS issue and a reboot generally fixes the problem, at least for a while. Smart Lock has always been quite hit and miss and it appears to be no different with the LG 40. Green tinge appearing on the screen – Quite a few users have noticed a greenish tinge appear at the top of the display that eventually becomes more opaque and covers the info the screen. This is definitely a hardware problem and the only option here is to get a replacement. A static sound from the speaker – Some users have noticed a crackling or static sound from the speaker, even when the volume isn’t set to the highest level. This is another hardware problem and the device should be exchanged for a new one. These aren’t really problems, but rather hidden in the settings menu and some may not know how to enable these features. 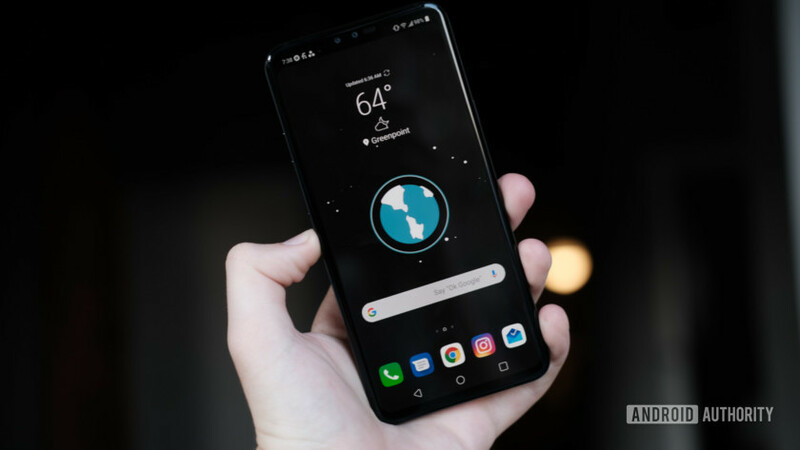 No app drawer: Out of the box, the LG V40 comes without an app drawer. All your apps are spread out across the home screens, and using folders is one of the ways to keep things organized. Luckily, LG offers a simple solution to bring back the app drawer and you won’t have to switch to a different launcher to get the app drawer back. Go to Settings > Display > Home screen > Select home > Home & app drawer. App scaling: The display of the LG V40comes with the now standard 18:9 aspect ratio. However, some apps don’t use the entire screen, leaving black bars at the top and bottom. App developers have been updating their apps to accommodate this aspect ratio and the notch. LG also has a solution. Go to Settings > Display > App scaling and you can enable “Fullscreen (18:9)” on any app supporting it. Hiding the notch: If you aren’t a fan of the notch, LG provides a simple way to hide it. Go to Settings > Display > New Second Screen. Set it to Custom and set the look of the status bar to how you like it. When the screen is not responsive, press and hold the power button and the volume down button for 10 seconds or until the device restarts. Use the volume buttons to navigate to Factory Data Reset and press the power button to confirm. Press and hold the power button and the volume down button. Release both buttons when the System Recovery screen appears. Use the volume keys to navigate to Safe Mode and confirm. These are the most common LG V40 problems, and potential solutions on how to fix them. If you have come across any other issues, let us know in the comments section below. We’ll try our best to find an answer for you! Next: LG V40 vs LG V30 – worth the upgrade?